This 3 story colonial style home is locate inside one of the most prestigious gated communities in the Central valley which offers 24/7 security, private and controlled access, basketball and tennis courts and a beautiful pool at the club house. Only a few minutes drive away from Escazú and Santa Ana its position provides excellent access to all the amenities and services and the convenience of being only half an hour away from the International Airport in Alajuela. 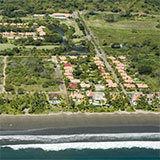 Built on a 1,000 M2 / ¼ acre terrain with 430 M2 / 4,625 sq. ft of construction this beautiful house features 3 main bedrooms each of them with its private bathroom and a walk in closet, a TV room, an spacious Studio; the master bedroom counts with an spacious private bathroom with Jacuzzi and very ample walk in closet. Enjoy an amazing panoramic view from almost all the bedrooms and areas of the house. You will find an ample and high end kitchen, besides there is a comfortable living and dinning room with a spacious guest bathroom, an office, a nice covered terrace, a storage room and next to the laundry room there is a full maid’s quarter and 2 covered parking spaces. This beautiful house was built with the most modern finishes including cedar, almond, high end ceramic, and Italian marble. The property overlooks the mountains and part of the valley offering nice sunsets and is surrounded by a big green area.